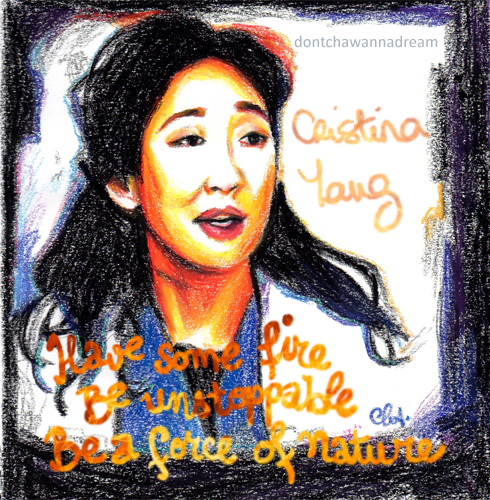 Love her, too, Cha, and the inspiring words…and of course, your painting is amazing. Your likenesses are to a tee! 🙂 Many hugs! Good advice. I’ll be gravity. You always capture the person’s likeness with few strokes. Wowww thanks!! It’s cool to read that it’s one of your fave. Because I really share these little wax pastel drawings to share something. They’re a good alternative for me because it doesn’t take me a lot of time to make them. Sooo if people enjoy them… I’m happy!! Beautiful work, I recognized her immediately. Excellent work, Princess! She looks perfect! Her portrait is beautifully done..
Yayyy. Watching season 9 lately and it’s so good!! !